The grand opening for the Jesse Beckius/Casey Owens Veterans Resource Center in downtown Glenwood Springs is at 6 p.m. Friday, Nov. 10. Veterans Day weekend in Garfield County is being marked with the opening a long-sought new hub of resources and camaraderie for veterans and their families. After working on getting building space for years, the Western Slope Veterans Coalition is celebrating the opening of the Jesse Beckius-Casey Owens Veterans Resource Center at 6 p.m. today. Though previous efforts to secure a physical space didn’t pan out, Garfield County commissioners surprised the organization last month by giving it the building at 803 Colorado Ave. in Glenwood Springs for a $1 lease. Pettit had been working on getting the coalition a building for the past four years. He and other veterans started the Western Slope Veterans Coalition after the suicides of two local veterans, the namesakes of the resource center. Since losing his son, John Beckius, who is the father of Jesse Beckius, has been working with Pettit to make the veterans coalition and the resource center realities. “It’s the grassroots organizations like the (veterans coalition) that have to make the difference. And having one place to go to get help is invaluable,” he said. When he was checked out, the VA gave him a bunch of pills they told him to take, he said. But a week and a half later, Jesse Beckius committed suicide. He’ll never be forgotten by his family, and this way he won’t be forgotten by the community as well, John Beckius said. Another goal of the resource center is to make the community aware that only seven-tenths of 1 percent of the U.S. population is serving or has served in the military, said Pettit. “That’s a very small number. And out of that small number, 22 veterans per day commit suicide,” he said. Of the approximately 43,000 suicides in the U.S. each year, about 10,000 of those are veterans, said Pettit. 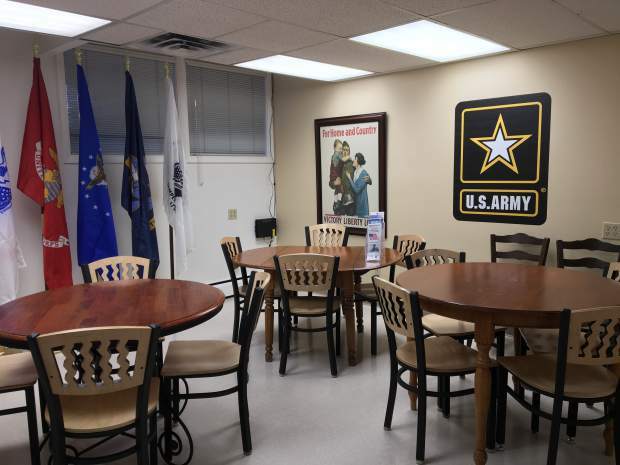 The veterans coalition also wants the resource center to be a social space. “We want it to be a place where veterans can go for that camaraderie that you lose when you leave the military,” said Pettit. And the resource center will be a hub of information and assistance for helping vets access the benefits they’ve earned. Many veterans have never had any contact with the VA and have no idea of what they qualify for, said Hopton. The resource center will also endeavor to help veterans get jobs and housing, and it is partnering with Colorado Mountain College to get vets back into school. Pettit hopes that local businesses will also come to the resource center when they’re seeking workers. “We could offer them some vets that could become very good employees,” he said. Garfield County’s veterans service officer is also being granted some room in the building space, along with CASA of the Ninth, the local judicial district’s court-appointed special advocates. The veterans coalition purposefully picked Nov. 10 as the opening day, as it is also the U.S. Marine Corps’ birthday. The coalition anticipates several government officials to be in attendance, including Rep. Scott Tipton, a representative from Sen. Michael Bennet’s office and Commissioner Tom Jankovsky.